Henri Matisse once said, “Creativity takes courage” and nothing could be truer about this look! Karen Black’s cashmere modal scarf acts as our muse with its painterly yet abstracted forms rendered in primary hues. Designed to drape effortlessly around the neck, it sits atop Marni’s mustard yellow sweater dress, which we dare you to wear over patterned pants! Yes ladies! A dress over pants is the look du jour! It takes guts, but if your proportions are right it can be a winner. Either go for just above the knee or mid-calf to ankle length. The line is also key so choose either an A-line dress with skinny pants or a straight shift with wide legs. To elongate your silhouette, opt for Dries Van Noten’s irresistible velvet pumps, with a heel so striking it deserves to be displayed on the mantle! 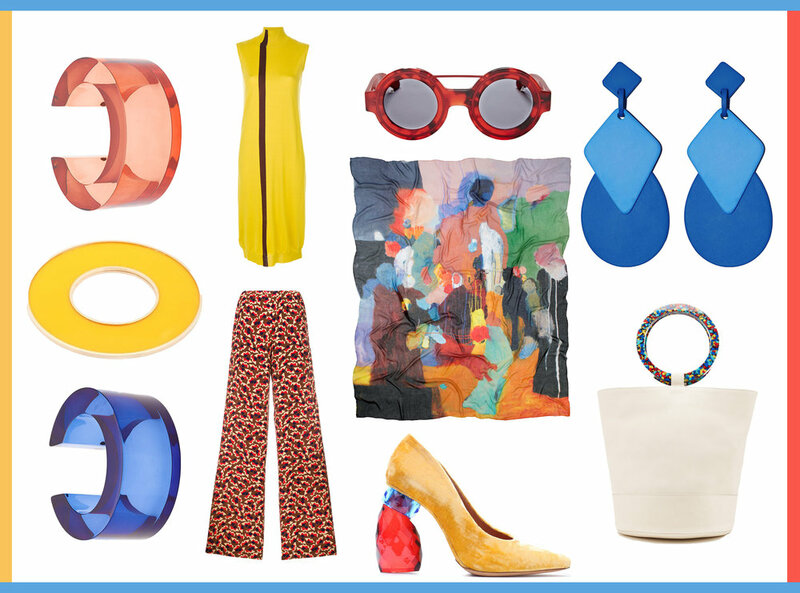 Make the colours in Black’s scarf go ‘pop!’ with bold Perspex accessories like these cuffs by Lizzie Fortunato and Sylvio Giardina and earrings by All Things Mochi. Simon Miller’s pony skin Bonsai bag breaks up the madness, while still offers an artistic edge with its speckled resin ring handles. Whack on a pair of crazy frames and you could almost be mistaken for one of Black’s colourful characters!